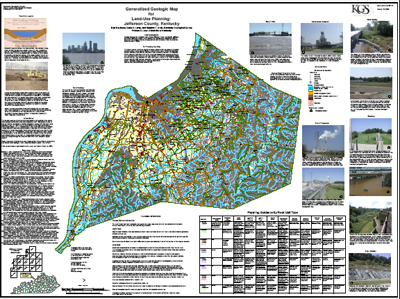 A wealth of geologic information is available to citizens of Kentucky at no cost, 24 hours a day. KGS is the official repository for oil and gas well and groundwater information, and also maintains a variety of other databases related to energy, mineral, and water resources. Thousands of people access these data to determine, for example, whether oil or gas wells have been developed on a particular land parcel or to determine the characteristics of coal beds on an inherited property. The most complete set of detailed geologic maps in the nation is also available to help answer questions about resources or the character of the land we live on. The data are easy to find and access on the website, and staff are available to answer questions about them. KGS scientists help identify new public water supplies for communities, particularly in eastern Kentucky. Evarts and Wallins (Harlan County), Campton (Wolfe County), and Hindman (Knott County) in the Eastern Kentucky Coal Field have benefited from such efforts. A number of high-yield water wells have been drilled as a result of research into delineating fracture systems that increase the flow of water above normal rates in the region. 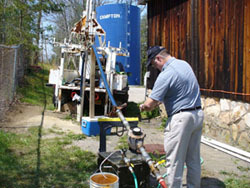 The use of water from abandoned underground coal mines has also been studied. KGS has participated in important research on the relationship between groundwater quality and the health of those who use it for drinking and other domestic purposes. 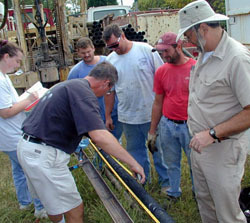 Working with the University of Kentucky's College of Public Health and the Kentucky Water Resources Research Institute, KGS has monitored private water wells, and families have been surveyed in the Jackson Purchase Region of western Kentucky for such research. Kentuckians are faced with a variety of geologic hazards that can cause property damage and injury. 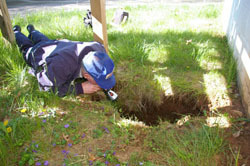 The most pervasive hazard is sinkholes, which form on limestone bedrock that occurs in more than half of the state. KGS geologists conduct extensive field investigations to document these features and track the flow of surface water into them through underground cave passages. These data are critical for community planners, developers, and homeowners who live in karst areas. Jim Currens received a University of Kentucky Commonwealth Collaboratives award to write a model local ordinance to guide development on karst terrain and to promote its adoption by local Kentucky governments. Landslides are prevalent in northern and eastern Kentucky. KGS geologists visit landslides around the state to determine their origin and assess the potential for further movement. 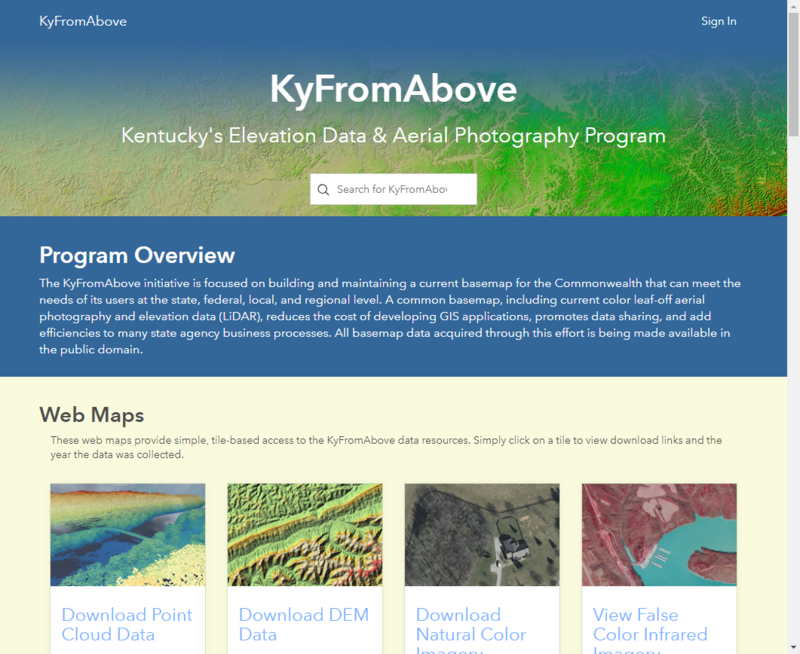 A database of information on nearly 2,500 landslides in Kentucky has been developed, and an online map service provides information to assist mitigation efforts by land-use planners, transportation officials, emergency managers, and the public. A KGS research project was also conducted to analyze maintenance costs related to geologic hazards along Kentucky's highways. Seismic hazards from earthquakes are possible in some parts of the state, but predicting the timing and magnitude of those events is challenging. UK seismologists monitor seismic activity recorded by 28 seismic stations in the Kentucky Seismic and Strong-Motion Network. The information recorded by the network will be used to develop seismic hazard maps to help policy-makers develop reasonable building codes for affected areas. Emerging unconventional sources of oil and gas in Kentucky, such as the Berea Sandstone and Rogersville Shale, are generating interest from energy companies and some controversy among environmentalists. KGS scientists have been involved in research to assess these resources and the potential impact of recovering them, including effects on water supplies and possible human-caused earthquakes related to resource recovery activities. State and federal funds have also been used to research the possibility of using carbon dioxide to force additional oil and gas out of depleted reservoirs in the state. Staff in the Energy and Minerals Section have studied the possibility that methane trapped in coal beds could be an economic energy resource and whether the Rough Creek Graben of western Kentucky may be a source of future oil and gas supplies. Earlier research also assessed the potential for deep geologic storage of carbon dioxide, in the event that legislation eventually requires the capture and storage of CO2 created by the energy sector and other industrial processes. 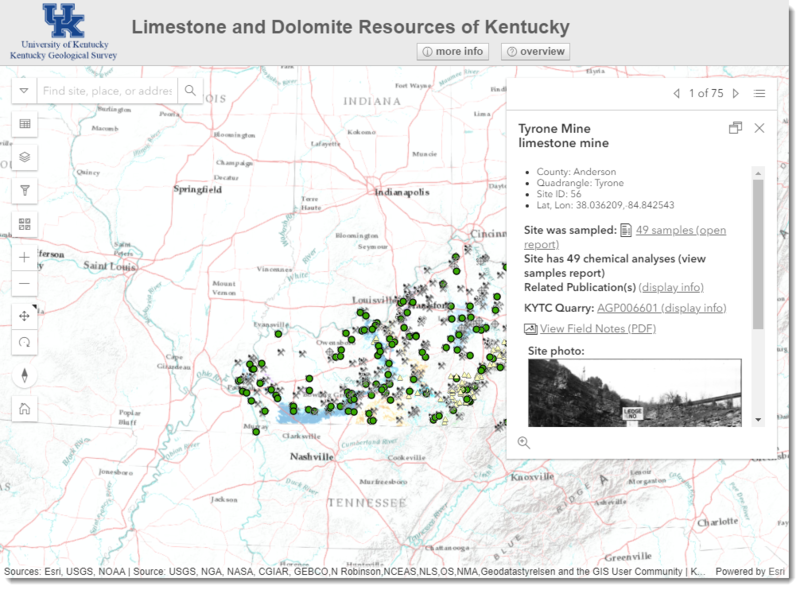 KGS has also assessed Kentucky's coal resources, which have historically been an important energy commodity for the state and nation. As a service to Kentucky's science teachers, the KGS website includes a link to the Earth Science Education Network, which has resources to help educators with topics addressed in the Kentucky Earth Science Core Content and national science education standards. 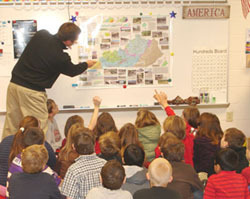 Classroom activities in the earth sciences, popular Kentucky earth science publications, and other useful resources can be accessed through the network. When the KGS map series "Generalized Geologic Maps for Land-Use Planning" was developed, it was intended to help nongeologists understand the geology of the places in which they live, work, and play and avoid damage from geologic hazards. Maps were completed for each of Kentucky's 120 counties, and copies of the maps are available for teachers to purchase for classroom use. Hundreds of teachers now have these maps in their classrooms across Kentucky. Thank you so much for sending my class the geology map for Fayette County. I have it prominently displayed in the classroom and my students started using it as soon as I hung it up to find sinkholes near their homes. The resource that you have provided will greatly enhance my instruction by clearly illustrating to my students the importance of earth science in their daily lives. Also, thank you for the web site links! On behalf of our entire Science Department, I want to thank you for the beautiful map of Mason County. It is full of terrific learning opportunities for our kids. I recently received the Floyd county map and it is wonderful. In fact it is so nice that the social studies teachers in my building and the rest of the science department asked it they could each get one. That is a total of 7 teachers. Just checking if it would be possible to get some more of those? Have a great day and great job on the map. Thank you so much for sending the maps of Allen County. They are very neat. I shared one of mine with the social studies teacher. However, when one of the other S.S. teachers saw them she really wanted one. If you are capable of sending another set that would be great! Once again thank you for sending such a wonderful resource to us at no cost! Thank you so much for the map of Lexington! My students and I are currently studying History of Earth based on sedimentary rock! This will be very helpful!